The steady positive momentum continues this week as the market breaks above $140B. The market cap reached $142B before suddenly dropping on Thursday. But, we still saw two and a half percent growth over the week. The majority of altcoins stayed in the single-digits while Ontology (31.58%), Tezos (71.61%), and Ravencoin (61.87%) led the pack. Bitcoin won the week, growing 2.44%. Ethereum was a close second with 1.53% growth. XRP didn’t have a great week, shaving 0.22% off the price. Dorsey Announces Square Crypto: In a Wednesday tweet, Twitter and Square CEO Jack Dorsey announced the formation of Square Crypto, an “open source initiative independent of [their] business objectives.” Dorsey is starting relatively small with the initiative, hiring three to four cryptocurrency engineers and one designer. Dorsey decided to launch the crypto project after a discussion with Square employee Mike Brock. Brock emphasized that the most impactful way for Square to help the crypto environment is to “pay people to make the broader crypto ecosystem better.” Dorsey promptly to action. The perks? You get paid in bitcoin, work from anywhere in the world, and work directly under Dorsey himself. Although Emanuel is leaving his position as mayor in two months, he’ll pass along his initiatives to whoever fills his shoes. Cryptocurrency’s Fight Against Predatory Payday Loans: 400 percent interest rate loans? Not on crypto’s watch. IBM Announces New Security Technology for the Crypto Custody Market: Lockbox environments, private keys, and cold wallets. IBM’s doing it all. Canada, Israel, Mexico, and India Move to Regulate Crypto Market: Four countries are making moves to clear the air on crypto regulations. Former Mt. Gox CEO Acquitted of Criminal Charges: To the surprise of almost everyone, Mark Karpeles is walking away as a free man in Japan. What Is NULS? | A Guide to the Modular Blockchain: It uses a modular blockchain, and it’s attempting to be the WordPress of the industry. IBM and Stellar Launch Worldwide Payments Network: IBM announced the launch of its Blockchain World Wire, a service utilizing the Stellar protocol to facilitate international payments and enable point-to-point money transfers. IBM originally announced the World Wire in October 2017, and the network is finally officially accessible in a handful of markets. Australia Prioritizes Blockchain Development: The Minister for Trade, Tourism, and Investment announced a national blockchain roadmap with $100,000 of seed funding from the Morrison Government to help Australia position itself as a global blockchain figure. 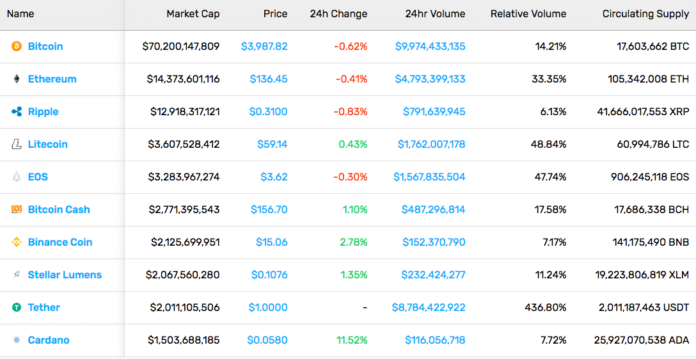 The post This Week in Cryptocurrency: March 22, 2019 appeared first on CoinCentral.